We are sponsoring an international competition to design a memorial to be erected at Deir Yassin. The competition is open to artists from all over the world, including Israel. There are no markers, no plaques, and no memorials at Deir Yassin; parking is a problem and access to the mental hospital grounds is, understandably, restricted. But tourists today can help keep memory alive and reinforce our efforts to memorialize Deir Yassin by asking about and visiting the site. Most visitors and virtually all politicians visit the most famous Holocaust museum, Yad Vashem. Literally, Yad Vashem means "a monument and a name," figuratively "a monument and a memorial." The name is drawn from Isaiah where God says to those who keep his covenant, "I will give them . . . a monument and a name . . . an everlasting name that shall never be effaced." Conceived in 1942 and codified in the 1953 "Law of Remembrance of Shoah and Heroism-Yad Vashem," this memorial park is Israel's preeminent national shrine. One of the most important tasks of Yad Vashem has been to record the names of every Jewish victim of the Germans to perpetuate the memory of the martyrs whose graves are unknown and unmarked. In his book, "The Texture of Memory," James Young writes, "The function of memory in this project is precisely what it has always been for the Jewish nation; in addition to bringing home the 'national lessons' of the Holocaust, memory would work to bind present and past generations, to unify a world outlook, to create a vicariously shared national experience." Of course, this is exactly the underlying task of Deir Yassin Remembered in its quest to build a memorial. For Palestinians, whose culture and history are largely oral, passed down in stories from generation to generation, the memory of Deir Yassin is paramount and cannot be denied. 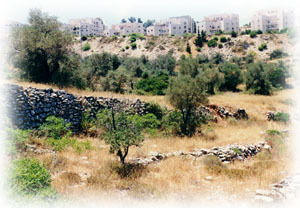 While there are those who would belittle it when compared to the scope of the Holocaust, to paraphrase Young: "The function of memory in this project is precisely what it has always been for the Palestinian nation; in addition to bringing home the 'national lessons' of The Catastrophe of 1948, memory works to bind present and past generations, to unify a world outlook, to create a vicariously shared national experience." It is a chilling fact that the Deir Yassin massacre took place within sight of Yad Vashem. The irony is breathtaking. Did those who conceived of the noble and necessary project of building the most important Holocaust memorial realize that the site they had chosen was tainted by brutalities of the past? While the idea of Yad Vashem was conceived long before the massacre, construction began years after it. Were the ghosts of Deir Yassin ignored or simply bulldozed over? In dedication ceremonies at Yad Vashem, did no one ever look to the north and remember Deir Yassin? Did no one speak of it? Were its martyrs so deeply buried that their cries for justice could never be heard? For further inquiries, please fill out the following form which will be forwarded via email to our staff. Please be patient, it may take up to two business days before you get a reply. Thank you!